"One day, all of a sudden I woke up and realized I like animals." 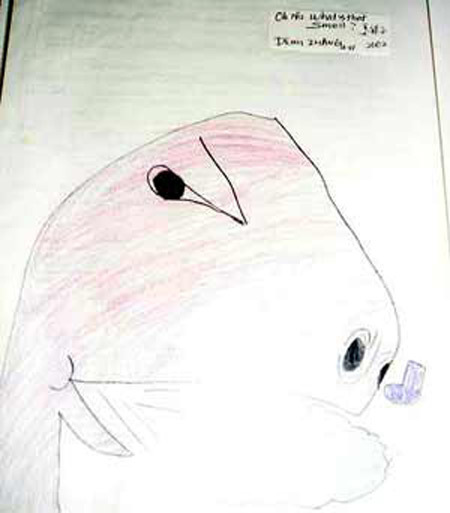 So begins the story of 9 year old author and artist, Demi Zhang. Demi is an only child. 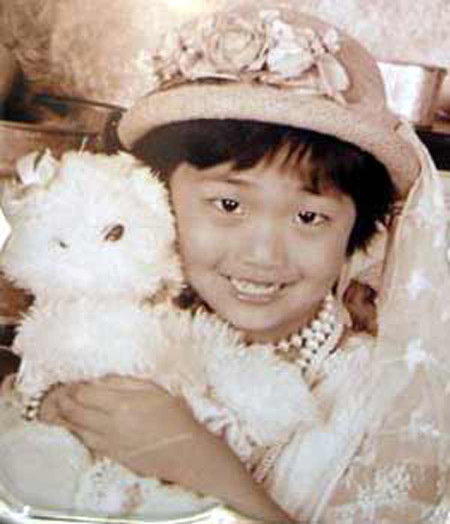 Her parents knew almost from the day she was born in November, 1997 that Demi was special. 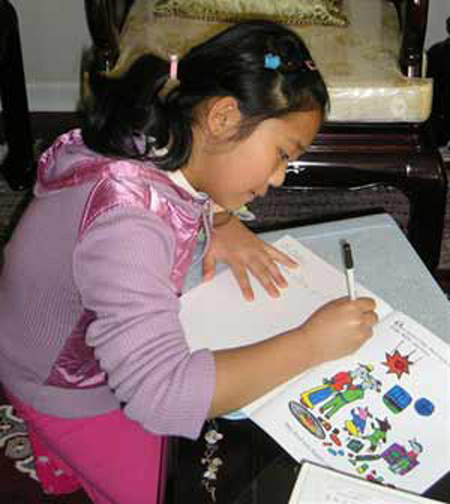 At age 4 she had already written her first book, a Chinese coloring book, JJ and ZZ. 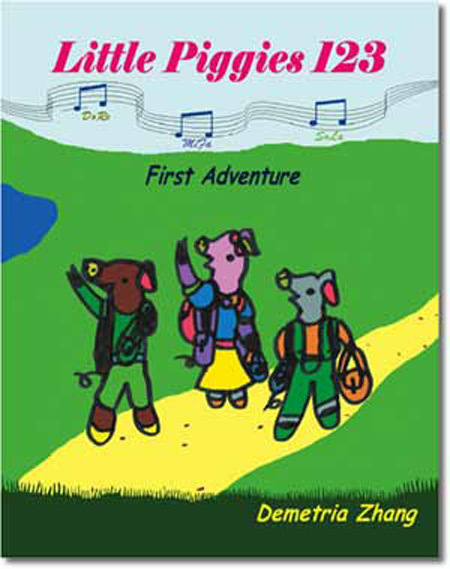 At age 5 she wrote and illustrated a picture book entitled Little Piggies 123 , which chronicles the adventures of three little piggies; DoRe, MiFa and SoLa. When she woke up that morning and realized she liked animals she instantly began to write stories about them. She has written about horses and other stories about pigs, but this was the first one published. "I would like to have two more books in this series." When the word "trilogy" is mentioned she asks for a definition and quickly makes the connection to "Lord of the Rings." She chose the names for her characters after her Grandmother taught her "Doe, a deer." She thought the names would be "appropriate." She goes on to explain some of the differences in the English musical scale and the Chinese musical scale, which brings her to the alphabet and finally to "Did you know alphabet comes from the first two letters of the Greek alphabet - alpha and beta?" She continues "Most English words have roots in Latin or Greek." She is both intelligent and articulate. She is a straight A student in a Gifted and Talented Program at her school. She gently brushed up against one of the many gorgeous plants in her home and quickly apologized to the plant saying "I hope I didn't upset your photosynthesis." A quizzical glance from this writer prompted her to remark that every fourth grader should know both the process of photosynthesis and the value of an apology. Yet there is nothing boastful or pretentious about her. She speaks with a precocious confidence that she can support through her deeds. Age 5 also earned the Cleveland Art Foundation's First Merit Scholarship and has received numerous awards and accolades since. 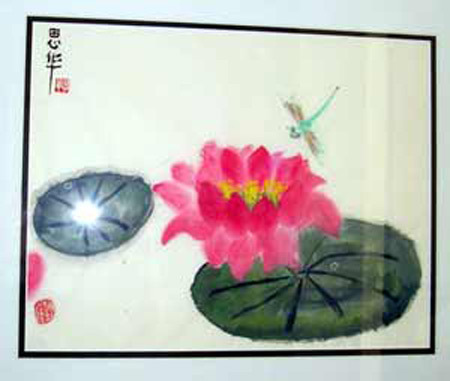 At age 7 her artwork was exhibited at The Professional Chinese Water Color Exhibition at St. Paul's Church in Akron and the following year she was shown in an Art Exhibit at the Brecksville Public Library. She wrote, directed and acted in a play, Pigowama Tale, once again with pigs as the main character. 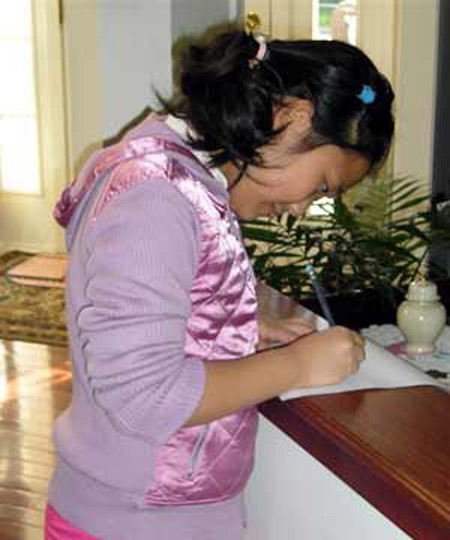 From ages 6-8 she won various awards in the National PTA Reflection Contest, including Visual Arts and Musical Composition. Demi is also an accomplished pianist and violinist and loves to ice skate and swim. "I think most I like to dance" She has appeared in the Ballet Productions of both Sleeping Beauty and The Nutcracker. And if that is not enough she has a yellow belt in Karate, with the next step (an orange belt) very close. 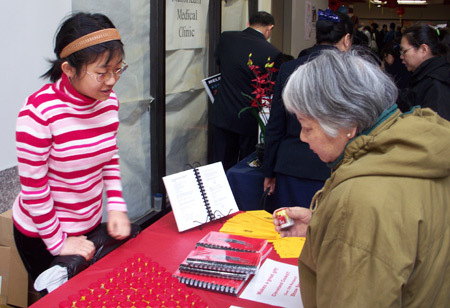 She speaks English and Mandarin Chinese, understands Cantonese and is studying Spanish in school. Demi has visited China more than once and finds children her age to be pretty much the same in both countries. "In China they might want what we have and in this country we might want what they have in China. People always think the other side is more cool." She also finds China to be very busy and crowded. "There is more hustle-bustle in China. Even on a short street you will see many cars and many dog walkers. Sometimes here there is no one out on the street. In China there are always people." Demi likes meeting new people, learning new customs and experiencing new cultures. "I remember when we were in North Carolina (or was it South Carolina? I don't remember). The wind was so wonderful. I love the wind." 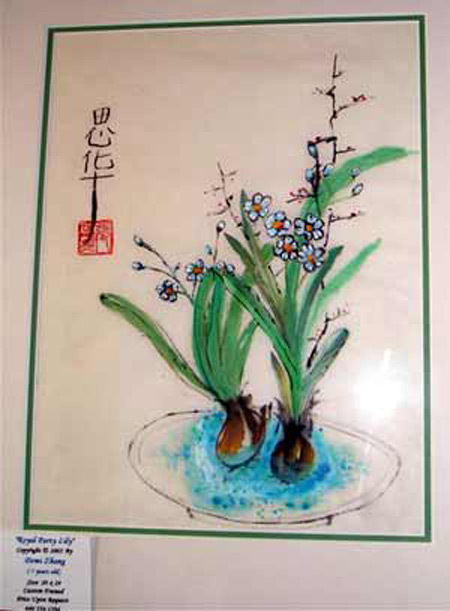 Her mother has kept a book of many of her drawings. One of Demi's favorites is a dinosaur with a sock. The dinosaur definitely smells something bad, and Demi has captioned it that way in the picture. "I think the moral of this picture is that a small thing can be very big. Like the smell of the small sock is very big to the dinosaur." Demi is not sure what her future will bring - she only knows it is very far off and is not something she needs to worry about right now. 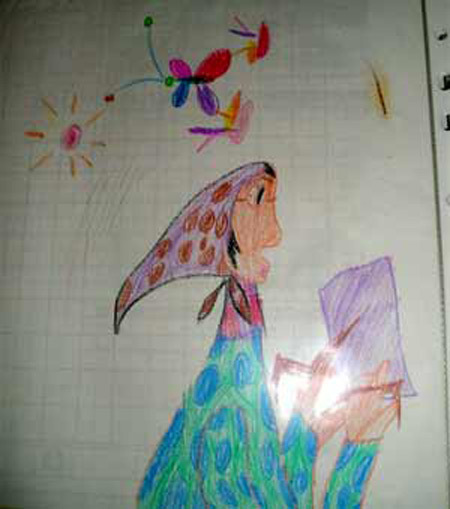 She feels she may work in animation or become a writer. A doctor is not out of the question but she definitely does not want to work with pregnant woman or be a surgeon. "I don't want to see anyone's bladder! But just a general doctor handling coughs might be okay." Her mother explains that Demi has no desire to be rich or famous; she would rather be in a quiet room. Demi expounds by standing up and twirling around with her arms outstretched. "I would just like to dance around saying Oh What a Happy Day!" Demi is a very literal child, possibly because of her knowledge of other languages she focuses strongly on the meaning of the words you say. When asked what she would say to a group of children her age and whether she thought she had any wisdom to share with them she chose to teach them how to mix paint to achieve the color you want. When asked how the young children in China differ from the young children here, she responds that the children in China speak Chinese. It is interesting to watch the thought process of a mind so young and yet so advanced. Her motto is "Never Give Up". She remembers trying to determine what her motto would be. She came up with three choices that she thought were "noble." They were: Never give up; Do Not Be Mean and; Do not talk to strangers. She decided Do Not Be Mean was too obvious and Don't talk to strangers was good advice but not a good motto. Never Give Up seemed to fit all of her criteria and therefore became her motto. She says it makes her happy to have things complete. "I don't like to hang onto a rope with only one hand while I am blowing in the wind. I could easily fall off. But if I can use two hands, I will not be off balance and I am more content." Demi also has a beautiful singing voice that she is not too shy to share. She sang a melodious love song in Mandarin, Chinese. "I don't mind the words, I just love the melody!" There is still more to Demi. In addition to all of her intellect and artistic talents she is a kind, charitable child who understands the need to help others. This year she went to see Santa Claus before Christmas and when he asked what she wanted she requested socks for the poor children. Her mother explained that there was a school drive to collect for the poor and Demi wanted to be sure Santa brought extra socks for those children. Her mother says "We want to teach her to be a real person, not just a high IQ." Next year Demi and her mother will be going to the senior center on a regular basis and Demi is going to entertain them with her piano and violin. 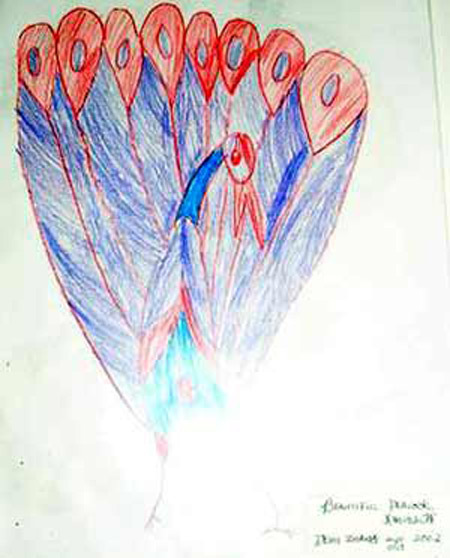 In addition to Demi and her parents, Demi lives with her grandparents, an arrangement she is very pleased with. Both of her parents are in Information Technology and are on call 24 hours a day. Not too worry though. There is always someone there with Demi. First thing every morning Demi asks for a book to read, even before dressing or getting ready for school. The last thing before she goes to bed she is usually finishing the book she started in the morning. However, when asked her favorite subject in school she does not answer reading, but rather Social Studies. Demi is interested in everything. She has a keen desire to soak up all of the knowledge she can and then put it to good use. Her parents fear that their busy schedules are holding Demi back. If it were up to her every one of the 24 hours in a day would be filled with activities and lessons. There seems to be nothing that will hold Demi back. She will go far in this world in whatever she chooses to do. She has the charisma, the intellect, the desire and the imagination to reach new heights and conquer new worlds. Those people lucky enough to be around her are going to be in for an outstanding ride into the future. Demetria Zhang. Demi. Remember the name. We are destined to hear it often. 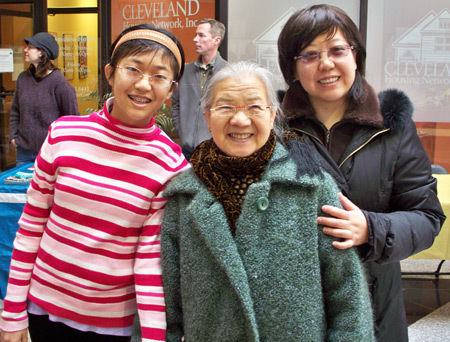 * Note: While we would like to share more, it is the policy of ClevelandWomen.com not to publish too much information or identifying photos of women under the age of 18. 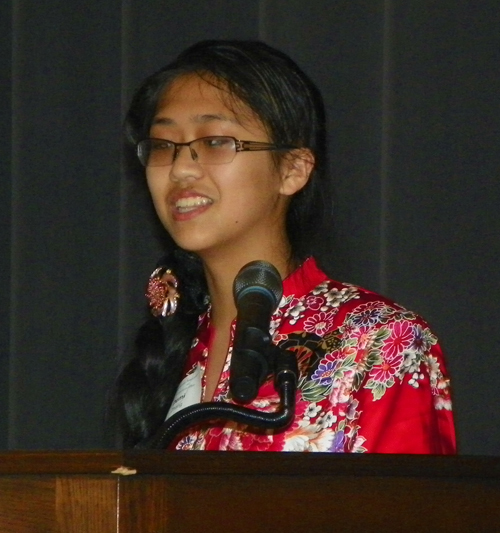 Update:Demi Zhang won the 2012 Princeton Prize in Race Relations. 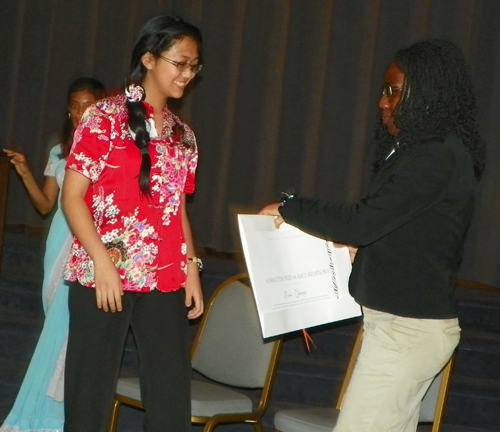 Demi performed Amazing Grace on the Guzheng - the Chinese Zither - at the award ceremony.